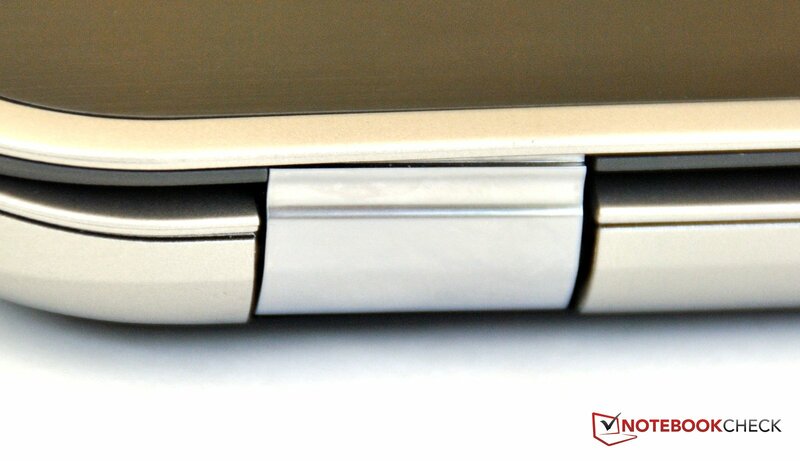 Softened Ultrabook. 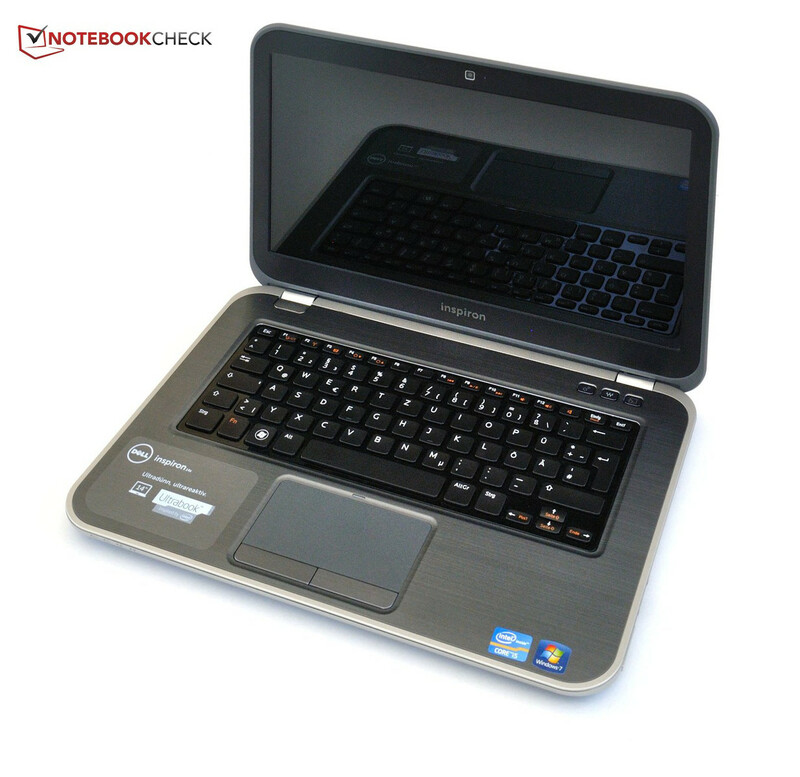 The Dell Inspiron 14z is an ultrabook with a ULV CPU and a dedicated graphics card. 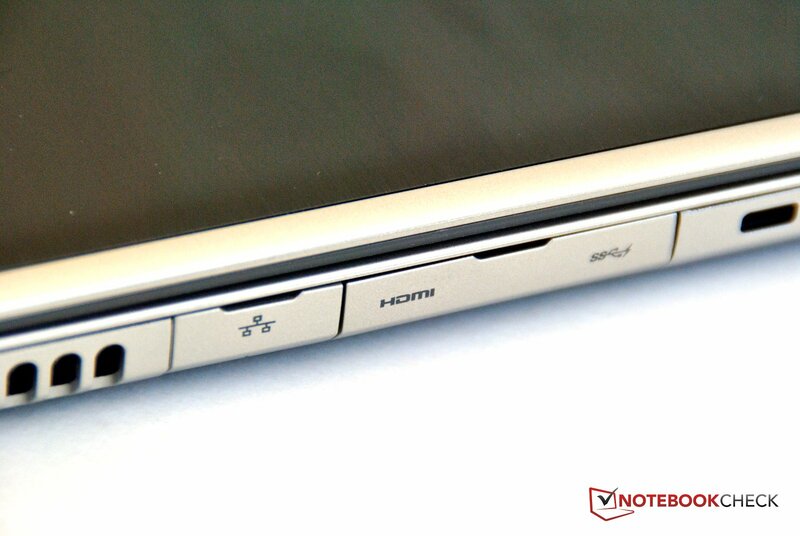 While it may not be as thin as others, it has better hardware and is a good candidate for mobile multimedia use. 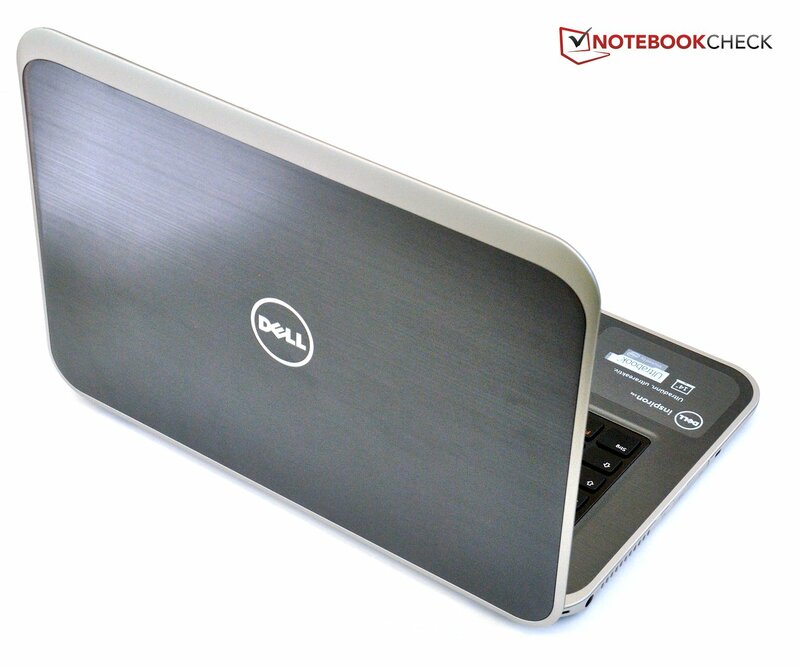 Dell offers two similarly named notebooks – the slightly outdated Dell Inspiron 14z and the newer Inspiron 14z Ultrabook that is tested in this review. With the Inspiron 14z Ultrabook, the Texas-based manufacturer continues its tradition of reusing model names to the point of confusion. 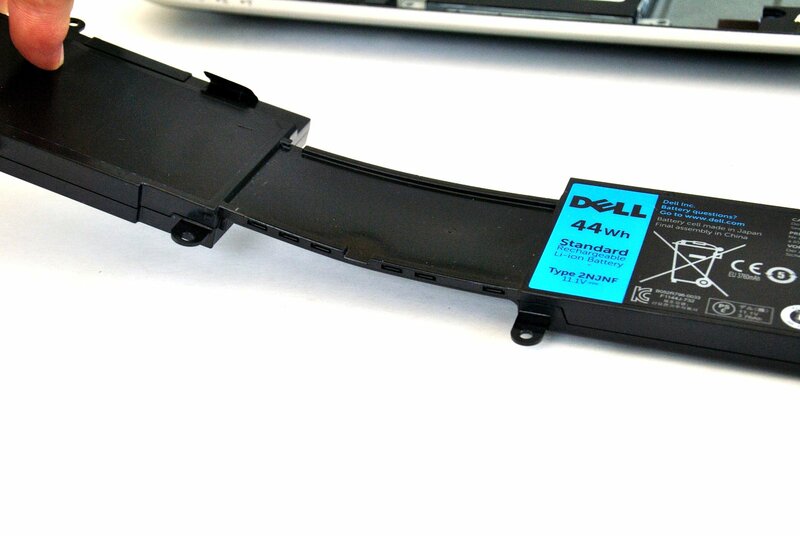 We had similar issues with the Dell Inspiron 15R SE. 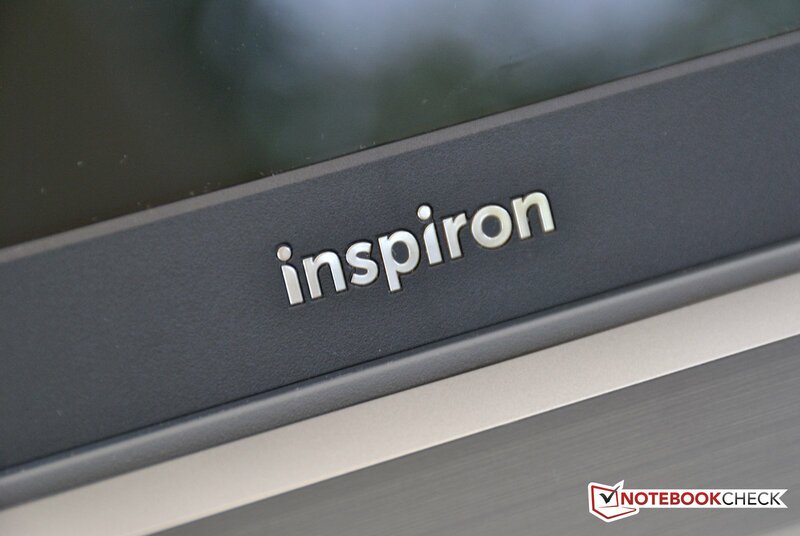 At first glance, the new Inspiron 14z Ultrabook does not resemble an Ultrabook in part due to its integrated DVD writer and design similar to that of recent Inspiron notebooks. 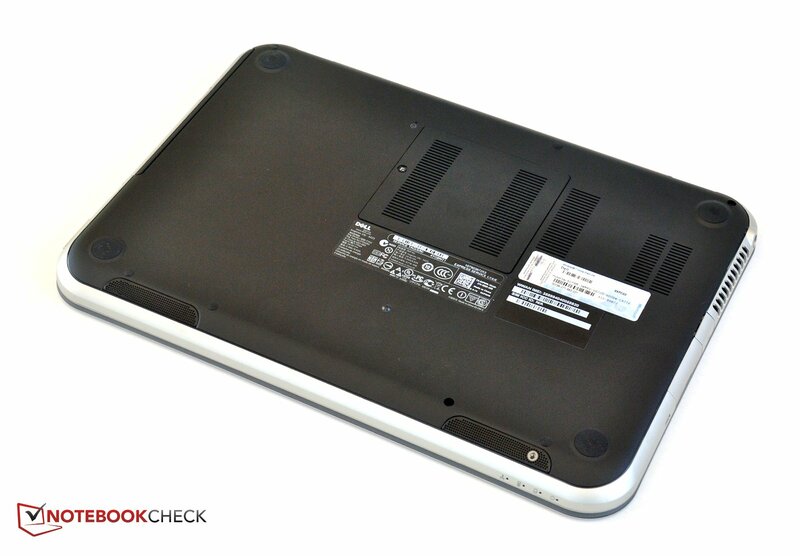 A closer look reveals why Dell labels this notebook as an ultrabook. The Inspiron 14z Ultrabook includes a ULV CPU designed for subnotebooks and ultrabooks, an AMD dedicated graphics card, and a fast Samsung SSD which significantly accelerates system performance. Is this a good deal for the 900 Euro (~$1125)? Read our review to find out. The case of the Dell Inspiron 14z Ultrabook is reminiscent of the new Dell Inspiron Z series due to its gray synthetic materials and large, rounded edges. While the display bezel and edges are made of the aforementioned gray synthetic material, the display lid is made from brushed aluminum in red or silver. Red is only available for the cheapest and most expensive configurations while silver is available for all configurations. The base is similarly made from gray synthetics on the sides and black synthetics on the underside. 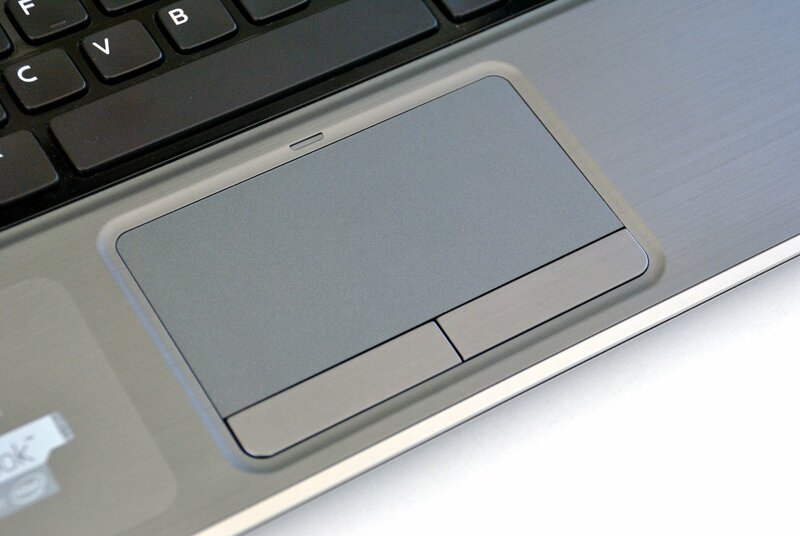 The wrist rest and surrounding area is made from a matte brushed aluminum. The only glossy components are the Dell and Inspiron logos and the keyboard base. While the sturdiness of the display hinges seemed sufficient, they should have nonetheless been a bit stronger. The hinges also limit the opening angle to a maximum of 130°. We found that the display could be deformed slightly but was stable overall. The base unit could also be depressed noticeably in some areas, specifically above the DVD writer, above the HDMI interface, and between the hinges. The corners, on the other hand, were not susceptible to external pressure. We found the workmanship to be average. The gaps were well-measured but the hinges were poorly installed. The latter caused a gap that is larger on the right side than the left. 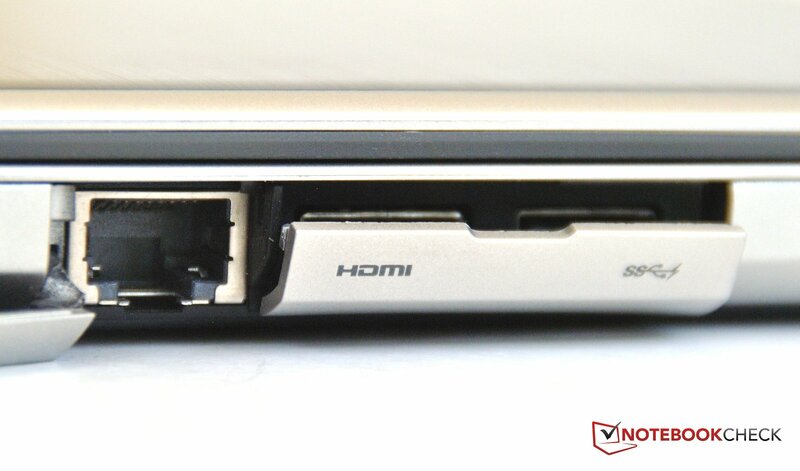 While the new Dell Inspiron 14z Ultrabook has all the necessary ports, it could have afforded more. The right side houses a USB 3.0 port, a combination headphone/microphone jack, and a card reader capable of reading SD, MMC, and MS/Pro formats. 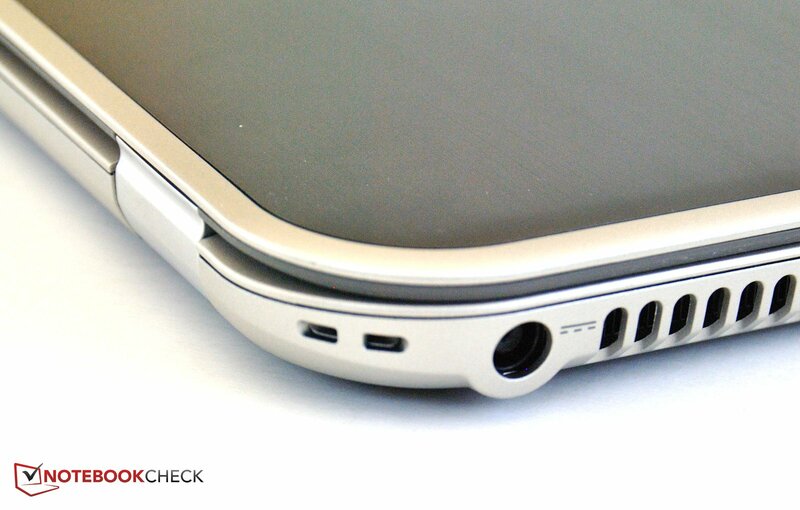 On the left side, flaps conceal the interfaces as was the case in the preceding Dell Inspiron 14z. Behind these flaps, one can find a Gigabit Ethernet interface, HDMI, and another USB 3.0 port which can power devices even when the laptop is turned off. The front of the notebook is free of interfaces but does provide four status LEDs. 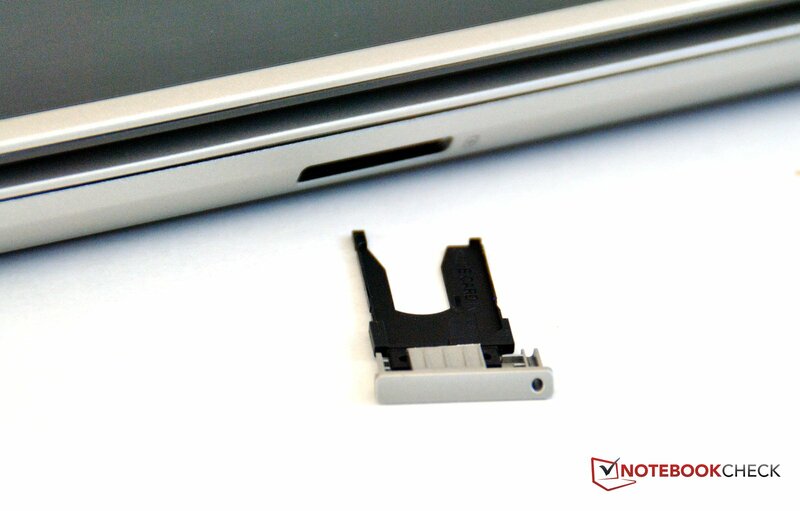 The rear end of the notebook has a slot for a SIM card. 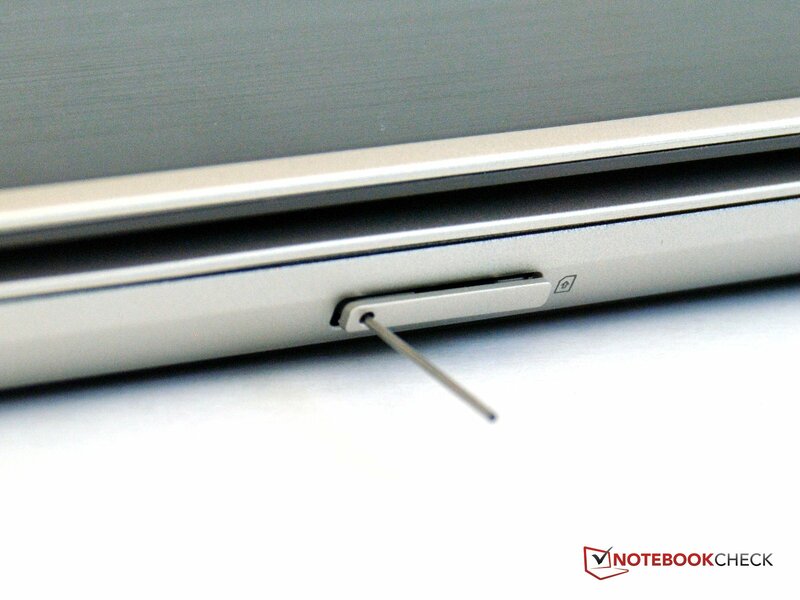 This card slot is covered by a flap that can be removed with a long, thin object. As an ultrabook, it goes without saying that the Dell Inspiron 14z Ultrabook has support for IEEE 802.11b/g/n and Bluetooth 4.0. As mentioned, the left side of the notebook also provides an interface for Gigabit Ethernet. Surprisingly, the webpage for this model does not mention the SIM card slot on the back or the Dell Wireless 5560 modem which supports HSPA+ (Evolved High-Speed Packet Access). This is an important feature as not every laptop is available with a modem. Users interested in a model with a built-in wireless modem should inspect the display cover option on the Dell configuration page as the option for configurations with (WWAN) and without (WLAN) a modem can be found there. 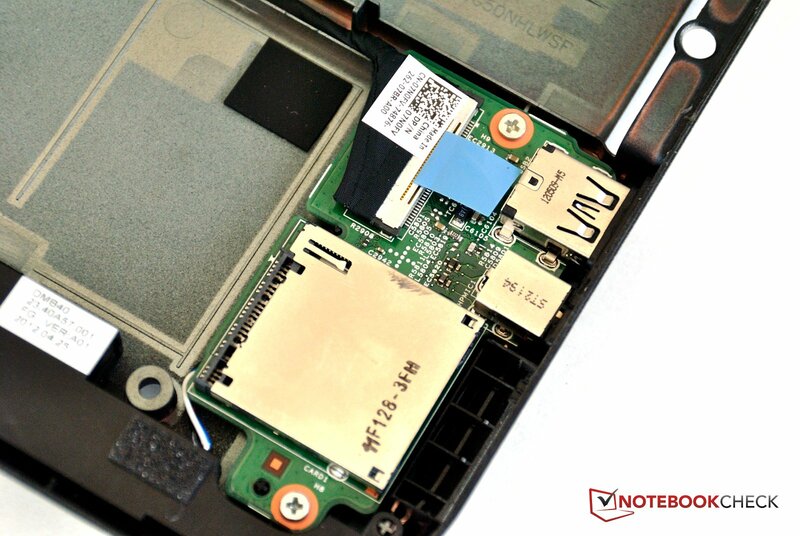 The Dell Inspiron 14z Ultrabook features a small cover on the underside that covers the RAM. 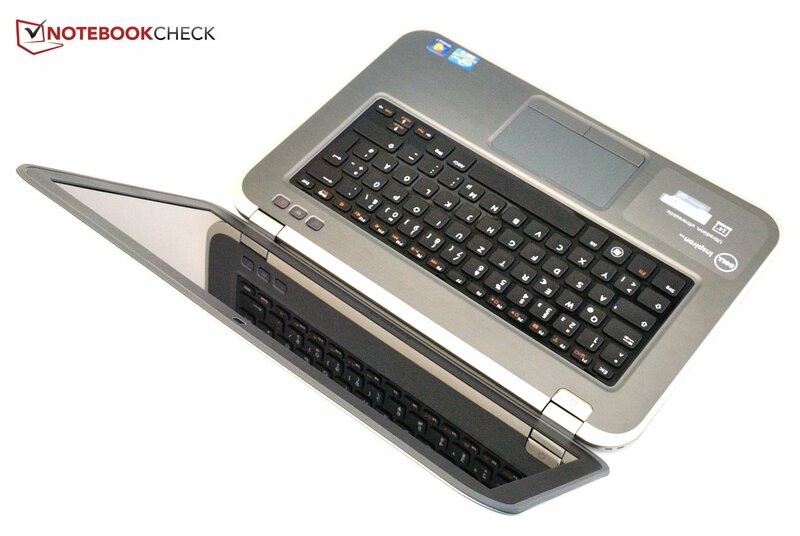 These modules can easily be swapped but access to the other hardware requires removal of the keyboard and base unit cover which is secured by multiple screws. This procedure is not recommended for novice users but can be performed with a little patience, some technical skills, and the Owner’s Manual from the Dell support page. 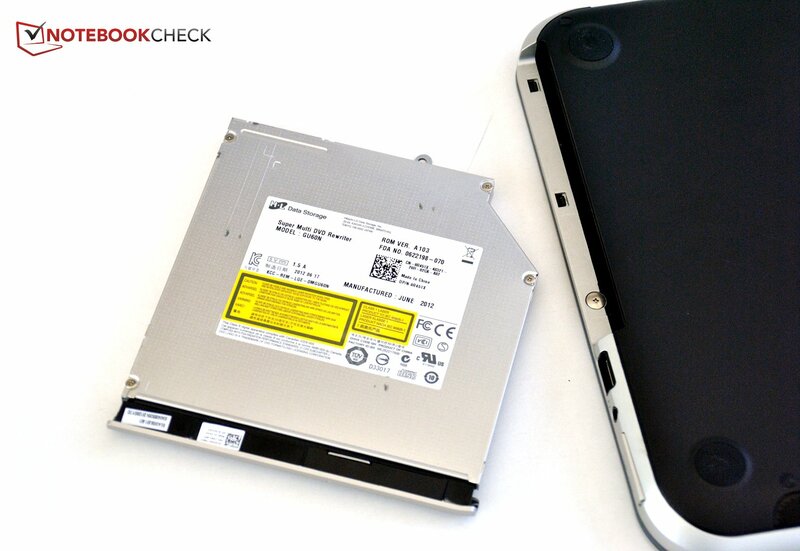 Once the cover is removed, the user can access everything from the hard disk to the battery and Wi-Fi card. 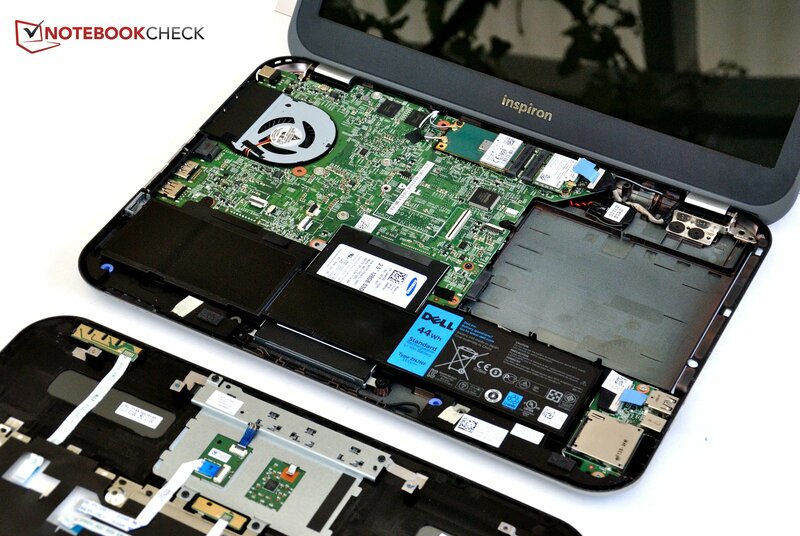 The Inspiron 14z Ultrabook includes a one-year on-site warranty with next business day service. This warranty can be extended to include free telephone support for 75 Euro (~$95) which can help users with problems such as installing a printer. For 140 Euro (~$175), the term of the warranty and support service can be extended to three years. 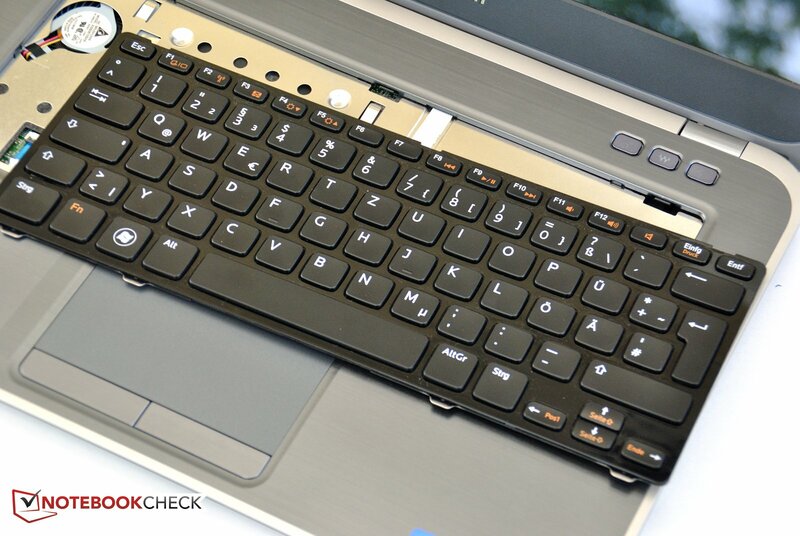 The keyboard for the Inspiron 14z Ultrabook features a different layout than those of other recent models from the Inspiron series. Keyboard width has been decreased by 3 cm (1.2 in) but key size remains the same. Due to this, a lot of keys on the right side have been displaced and the Enter key has become quite small. The height of the cursor keys has also been decreased. 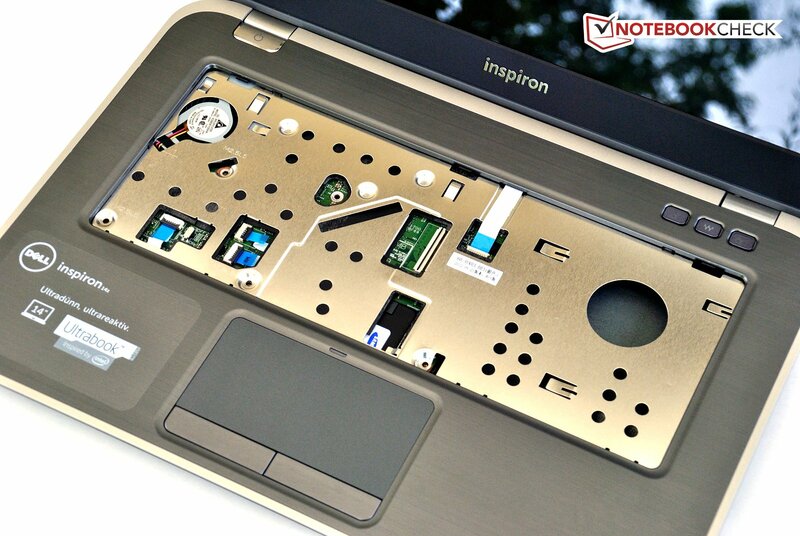 We found this change unnecessary as the case has enough space to accommodate the standard keyboard of other Inspiron models. Subjectively, the typing feel of the new keyboard is slightly worse than the previous model. The stroke distance is much shorter yet resistance is stiffer. With a little force, a user can still type well on this keyboard. Sadly, the area around the DVD writer yields slightly while typing. Above the keyboard on the right side are three additional buttons. The left of these opens the Windows Mobility Center, the middle switches between various sound profiles, and the right button can be freely configured by the user. 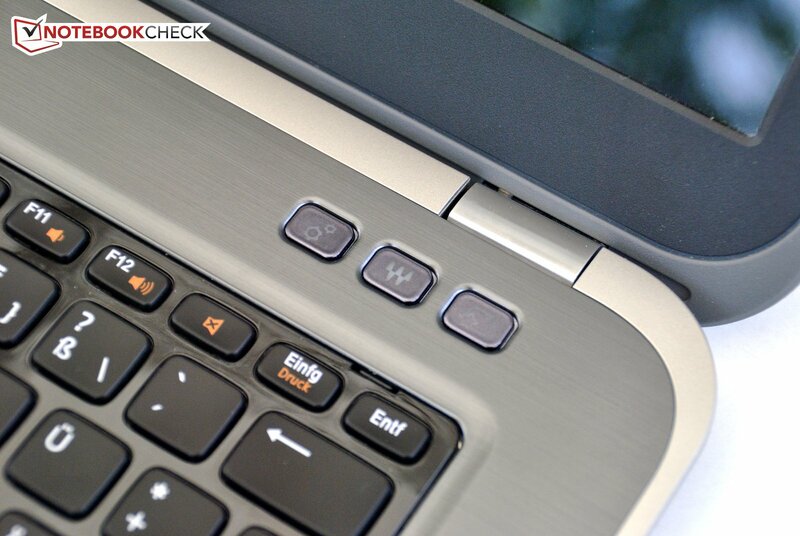 The Inspiron 14z Ultrabook uses a rather large touchpad with a sensitive surface. Capable of multi-touch support, the touchpad can be adjusted to suit each user’s preferences using the included Dell software. The entire touchpad can be disabled using an Fn key combination and such a state is indicated by a small orange LED above the touchpad. Unfortunately, the touchpad did not always translate gestures precisely. After moving the cursor to the desired location, removing a finger from the touchpad occasionally caused the cursor to jump downward slightly. However, the user is likely to become used to this and press the left mouse key before removing his or her finger. For this price category, the mouse buttons were quite good and have sufficient stroke distance. They offer good feedback and were relatively quiet. Like the wrist rest, the surface of the keys is made from metal. 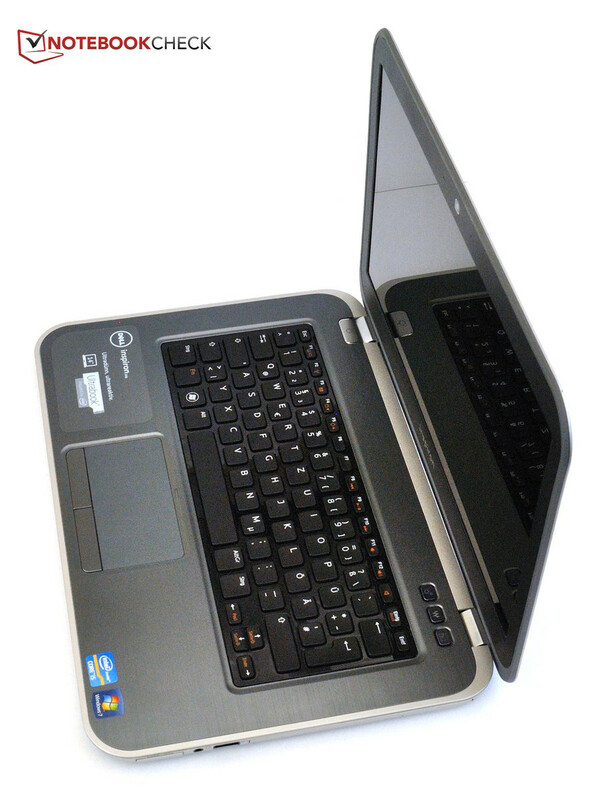 The Dell Inspiron 14z Ultrabook uses a 14-inch (diagonal) AU Optronics AUO203C 1366x768 display. 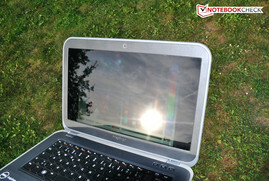 Unfortunately, the notebook uses a glare-type display which is likely to cause annoying reflections. We observed an overall maximum brightness of 209 cd/m2 and a minimum brightness of 188 cd/m2 in the lower right corner. We also observed an average brightness that barely broke the 200 cd/m2 mark. These results place the notebook in the lower-middle class which is strange considering such a mobile device should have a higher brightness. 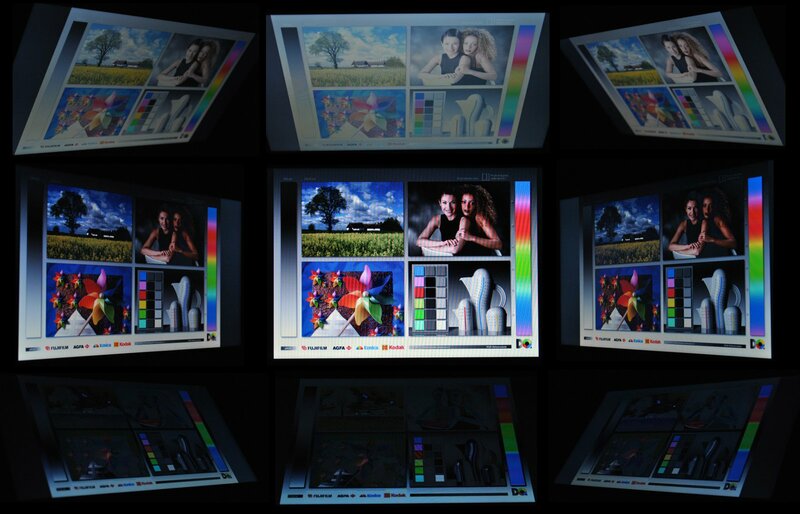 Due to the rather small variations in brightness, the display’s illumination was quite good at 90 percent. 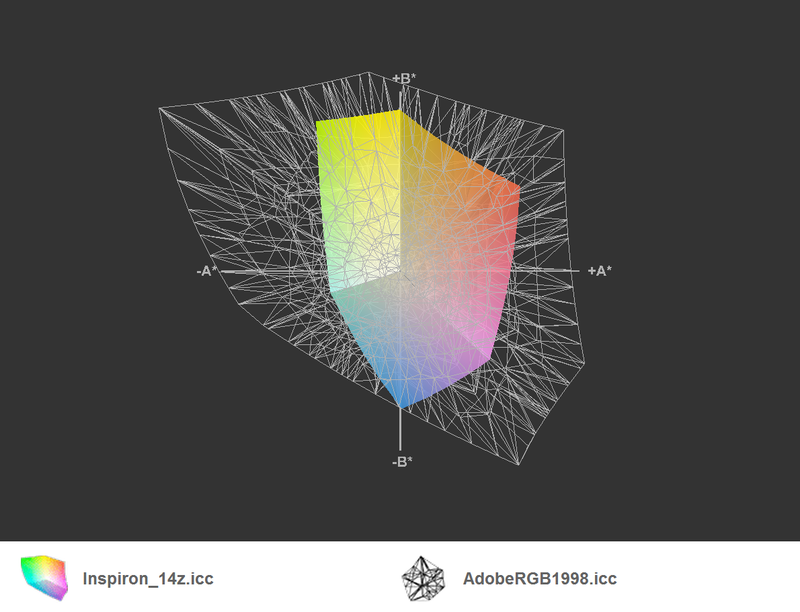 The measured black value of 1.06 cd/m2 was also middle-of-the-road and combined with the modest brightness to result in a low contrast ratio of 200:1. The display did not come close to covering the sRGB and AdobeRGB color spaces but that is to be expected for a consumer notebook. 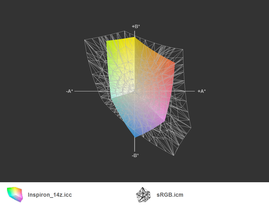 The blue-violet spectrum was especially weak. Even in bright indoor settings, the display demonstrated strong reflections. 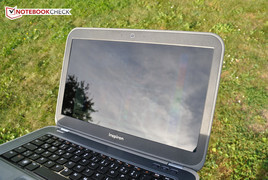 As a result, the notebook was no fun to use outdoors where the modest brightness did not stand a chance against direct sunlight. 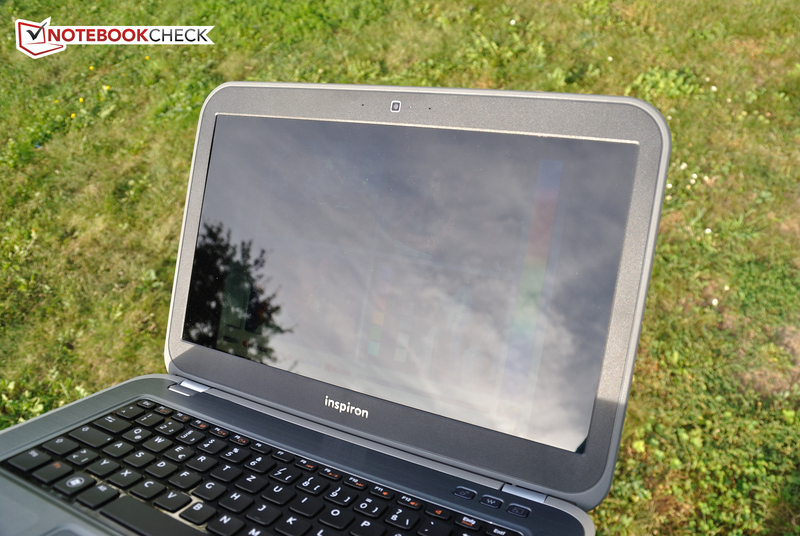 We would recommend users find shade for using the notebook outside. ... and in the sun. We found the viewing angles to be miserable. Viewing the display from the side resulted in black tones appearing grey but screen contents remained recognizable. Viewed from above, the display was much darker and even black-and-white text was difficult to read. From below, no colors were visible and the content was impossible to read. The larger Inspiron 15R Special Edition, had a much better display. Currently, the Inspiron 14z Ultrabook is available in five configurations. For 700 Euro (~$875), the cheapest configuration includes the second-generation Sandy Bridge Intel Core i3-2367M which represents an outdated entry model processor. As a Sandy Bridge processor, the Intel HD Graphics 3000 is integrated into the processor. The performance of this card cannot compare to the performance of a dedicated graphics card. The remaining four models use the AMD Radeon HD 7570M dedicated graphics card as well as the Ivy Bridge processor-integrated Intel HD Graphics 4000 graphics card. The latter is not as powerful as the Radeon HD 7570M but requires less power to operate. Two configurations use the Ivy Bridge Intel Core i5-3317U ULV (ultra-low voltage) processor. This processor is designed for small compact systems and has lower heat generation and power consumption but is also less powerful. 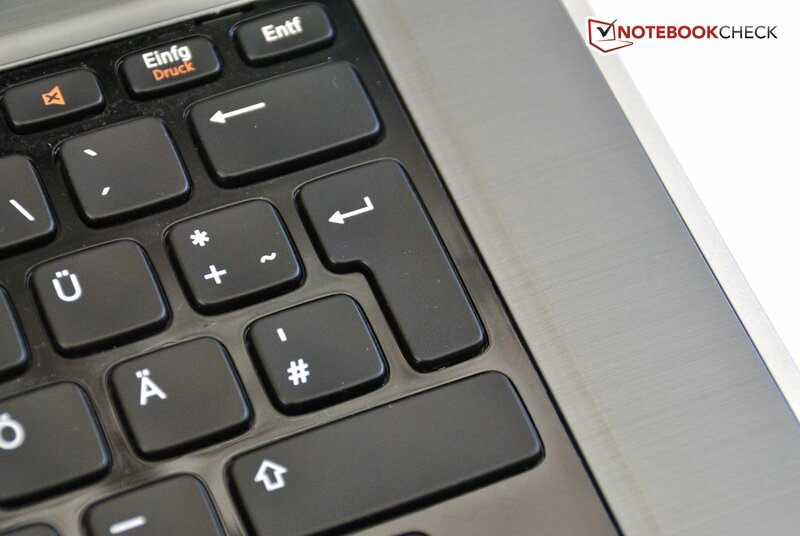 The remaining two configurations use the most powerful processor available for the Inspiron 14z Ultrabook, the Intel Core i7-3517U ULV processor. This processor features a base clock speed of 1.9 GHz and can be Turbo Boosted to 3.0 GHz as long as cooling is sufficient. 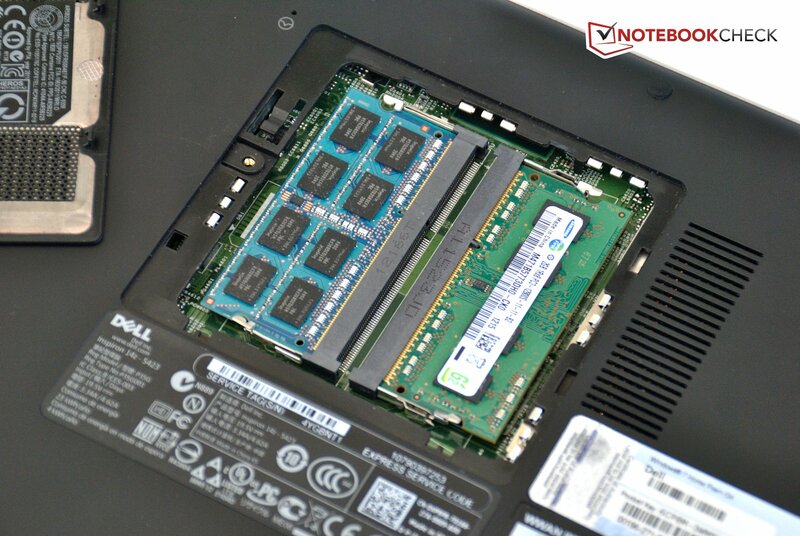 In terms of memory, the Inspiron 14z Ultrabook can be configured with between 4 and 8 GB RAM. The storage device options include a 5400 RPM 500 GB physical hard disk and SSDs ranging in size from 128 to 256 GB. 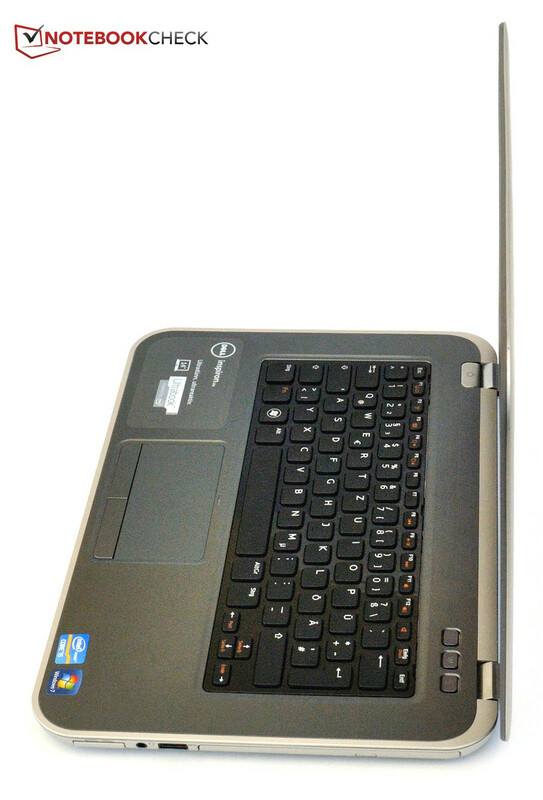 Our test model uses the Core i5-3317U ULV processor, 6 GB RAM, and a 128 GB SSD. 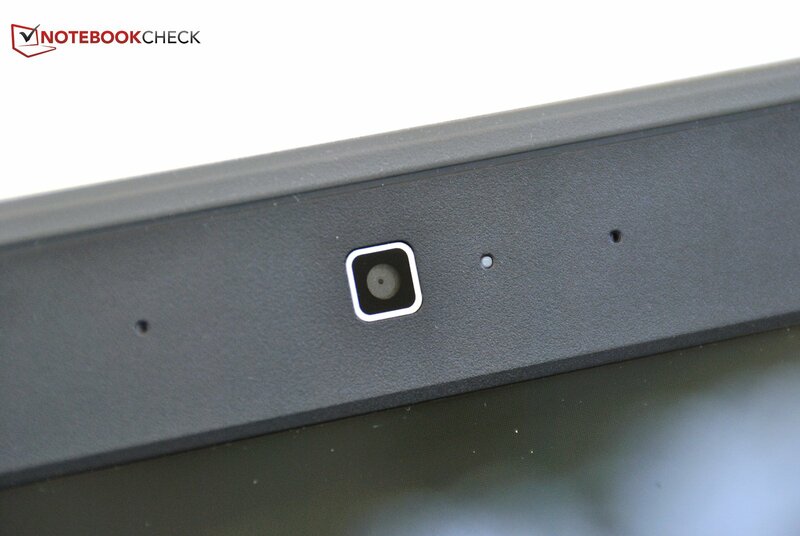 From a specification standpoint, our sample can proudly claim the moniker of ultrabook. 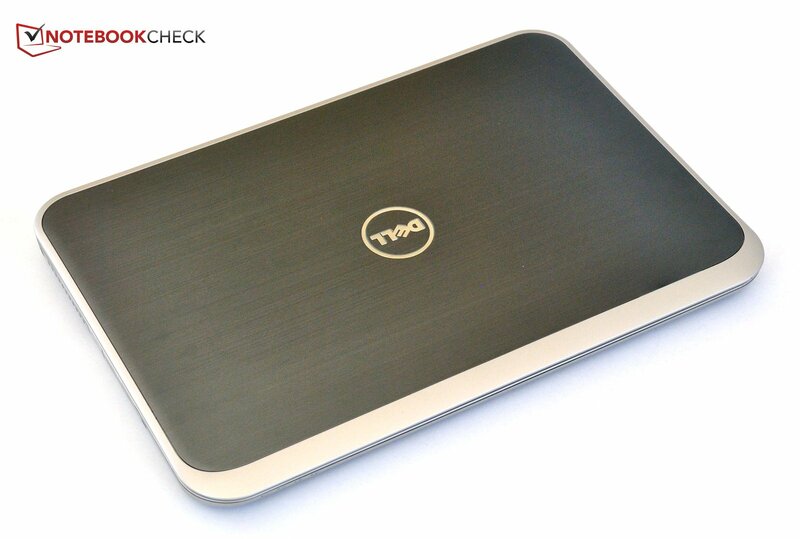 Our sample Inspiron 14z Ultrabook features the Core i5-3317U which operates at 1.7 GHz and can automatically overclock itself to 2.4 and 2.6 GHz for single-core and dual-core operation respectively. This ULV CPU has a lower 17-Watt TDP than standard voltage processors and is particularly well suited for thin ultrabooks. We used Cinebench R11.5 to test the performance of this processor by rendering graphics. 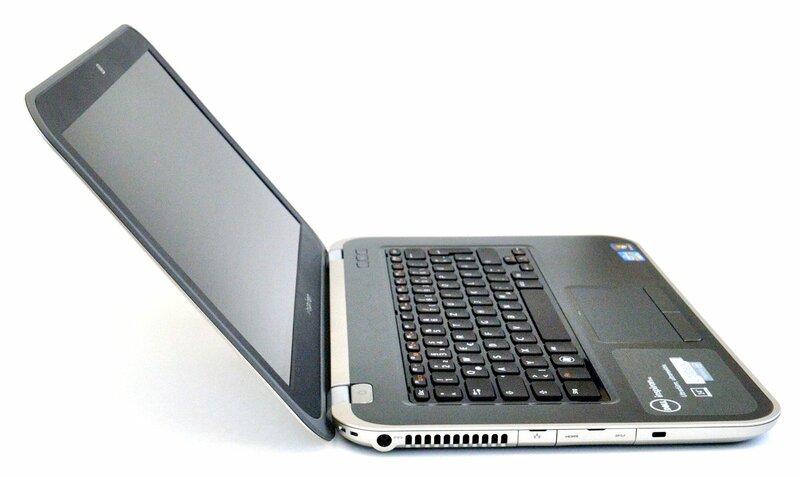 The Core i5-3317U achieved a score of 2.39 points which is comparable to other notebooks with the same processor. This result also places the Core i5-3317U just below the formerly popular Intel Core i5-2410M. The other configuration options, the Intel Core i3-2367M and Intel Core i7-3517U, scored 1.3 and 2.8 points respectively. To determine overall system performance, we use the PCMark suite of benchmarks. In PCMark Vantage, the Inspiron 14z Ultrabook scored 10932 points which places the notebook in the upper-middle range. This high ranking is due largely to the SSD which is clearly noticeable in everyday use as it accelerates system startup and reduces the load times of programs. 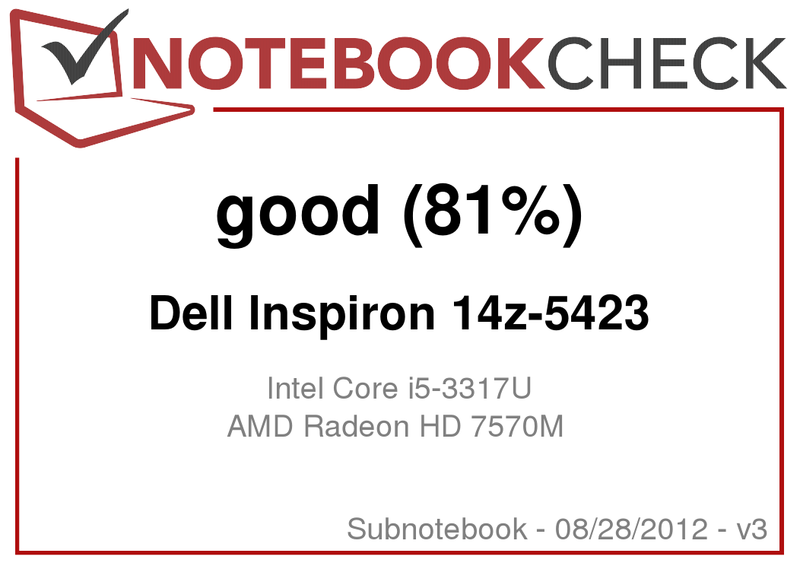 By comparison, the aforementioned score for the Inspiron 14z Ultrabook is comparable to the Asus Zenbook Prime UX31A which uses the same processor and SSD. The Asus ultrabook managed a nominally better 11072 points. Notebooks with physical hard disks like the Samsung 530U3C-A01DE tend to score lower in PCMark Vantage. The Samsung notebook uses the same processor but scored a mere 6855 points, partially due to its reliance on the integrated Intel HD Graphics 4000. The cheapest configuration of the Inspiron 14z Ultrabook would likely be comparable to the Toshiba Satellite L830-10F and would score approximately 3400 points. The lack of an SSD would also be the primary reason for a reduction in score. 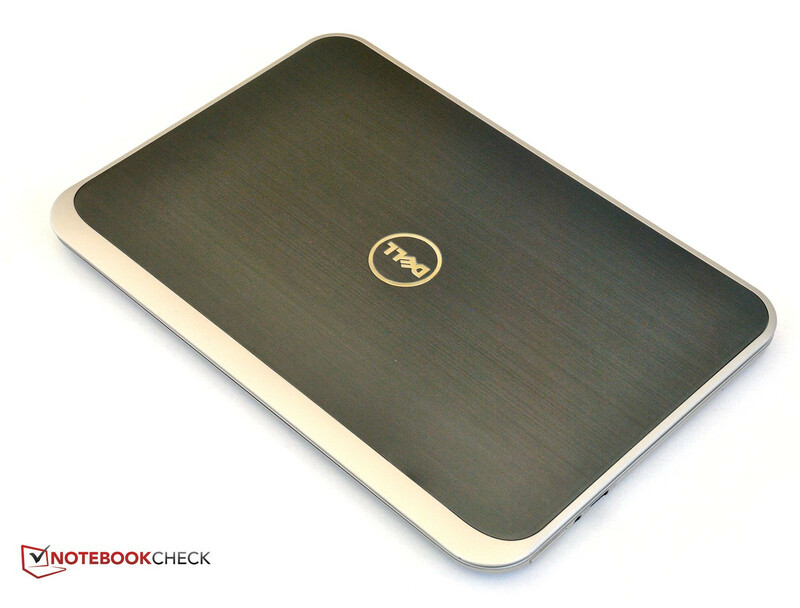 The Dell Inspiron 14z Ultrabook uses the latest Samsung 830 Series SSDs. Our sample model uses the 128 GB version with an advertised read speed of up to 520 MB/s. Sadly, we did not reach such a high transfer rate in our test. The AS SSD benchmark recorded a maximum speed of 464 MB/s in sequential read. The SSD did however demonstrate great access times. We observed an average read access time of 0.149 ms and an even better average write access time of 0.905 ms. These numbers place the SSD in the upper class of drives and the drive can clearly provide fast notebook performance. The physical disk option for this notebook features a 500 GB storage capacity but only a 5400 RPM rotational speed. In terms of both access time and transfer speeds, the physical disk would lag behind the Samsung SSD considerably. The Inspiron 14z Ultrabook features two graphics cards. The processor-integrated Intel HD Graphics 4000 handles low-demand tasks and video playback. During periods of higher graphical demand, the dedicated AMD Radeon HD 7570M becomes active and the HD Graphics 4000 is deactivated. All benchmark tests were run using the dedicated Radeon HD 7570M which has 1 GB memory and operates at 500 MHz. In 3DMark11, the card managed a score of 908 points which places it just behind the popular NVIDIA GeForce GT 540M. The Intel HD Graphics 4000 only managed about 75 percent of this performance. 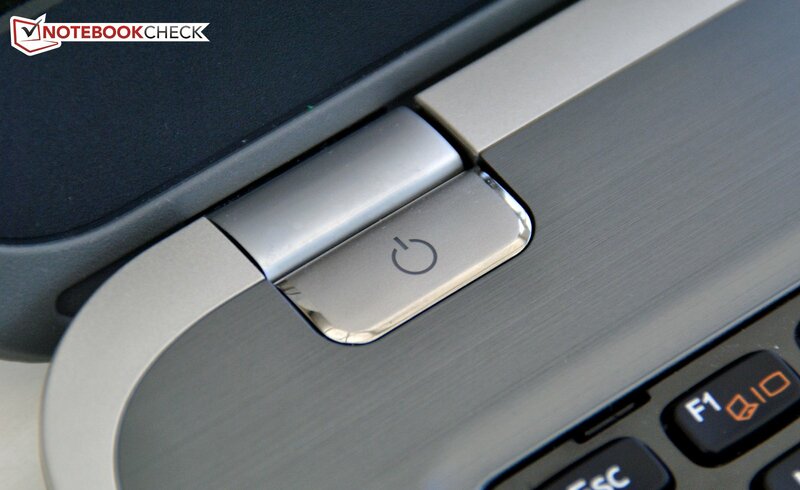 The Inspiron 14z Ultrabook is not intended to play demanding games. Most games ran somewhat fluidly at low and sometimes medium settings. However, neither the ULV CPU nor the middle-class GPU are capable of running games well at higher details with the exception of games like Fifa 12. This game can be run at maximum settings but the frame rate dropped to 25 fps at times. The Inspiron 14z Ultrabook remained quiet while running office programs. The Ultrabook once again benefited from the SSD. While traditional physical disks can be noisy under access, SSDs employ no moving parts and thus remain silent. In this scenario, we observed a noise range of 31 to 31 dB. The DVD drive was considerably louder but the relatively good 33 dB noise level would not disturb the user while watching a movie. Under load, the notebook became considerably louder, reaching almost 40 dB. However, the noise was not subjectively distracting. Even though the Inspiron 14z Ultrabook’s cooling fan ran modestly, the temperatures were quite high. While idle, the wrist rest and touchpad remained cool and under 30°C (86°F). However, the metal surfaces between the keyboard and display were considerably warmer. The underside remained cool overall but was warmer, up to 37°C (99°F) near the heat exhaust vent. After one hour of load, the wrist rest exceeded the 30°C (86°F) mark and was noticeably warm to the touch. To the left, near the start button, we measured temperatures up to 48°C (118°F). This temperature can be rather uncomfortable but is possibly noncritical as one does not have to place a hand there. The underside reached a much higher temperature of 56°C (133°F). (±) The average temperature for the upper side under maximal load is 38 °C / 100 F, compared to the average of 30.7 °C / 87 F for the devices in the class Subnotebook. (-) The maximum temperature on the upper side is 47.8 °C / 118 F, compared to the average of 35.8 °C / 96 F, ranging from 22 to 57 °C for the class Subnotebook. In our stress test, we used Prime95 and FurMark to simultaneously and fully stress both the CPU and GPU. The stress test forces the cooling system to demonstrate its capabilities. When conducting this test on the Dell Inspiron 14z Ultrabook, we observed that the CPU clock speed dropped to 1.4 GHz which is less than the standard clock of 1.7 GHz. The graphics card continued to operate at 500 MHz and was able to deliver constant performance. When only the CPU was stressed and the integrated HD Graphics 4000 was in use, the CPU clock remained stable at 1.7 GHz. After one hour of stress testing, the CPU and GPU temperatures were both modest at 80°C (176°F). Immediately after completing the test, we ran 3DMark11 again and recorded a score that was comparable to the results from before the stress test. This allows us to conclude that throttling should not occur in everyday use. 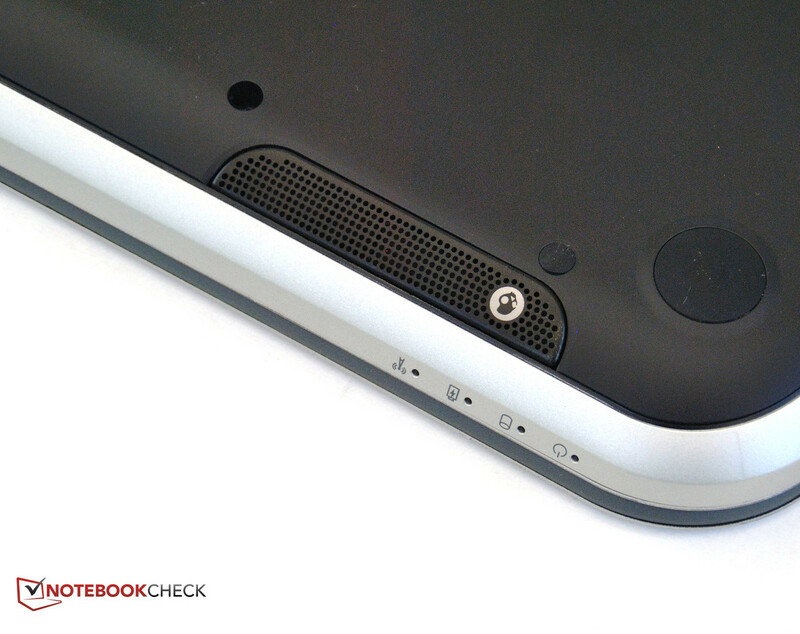 As with other Inspiron notebooks, the speaker bar of our Inspiron 14z Ultrabook features speakers made by American headphone manufacturer Skullcandy. We found these speakers to be quite loud and capable of good sound quality except for a lack of decent bass. The choice of sound profile, using the aforementioned quick access key, did not subjectively improve the quality of audio output. We only noticed slightly different maximum values. The “Music” setting offered the highest maximum volume. When using only the integrated Intel HD Graphics 4000, the power consumption of the Dell Inspiron 14z Ultrabook was quite low. We measured a minimum consumption of 7.4 Watts using the lowest display brightness and Wi-Fi module disabled. With the Wi-Fi module enabled, display at maximum brightness, and using the High Performance profile in Windows, the ultrabook’s consumption stayed under 10 Watts. Under load, with the AMD graphics processor enabled and the CPU fully stressed, the Inspiron 14z Ultrabook consumed 37.4 Watts. 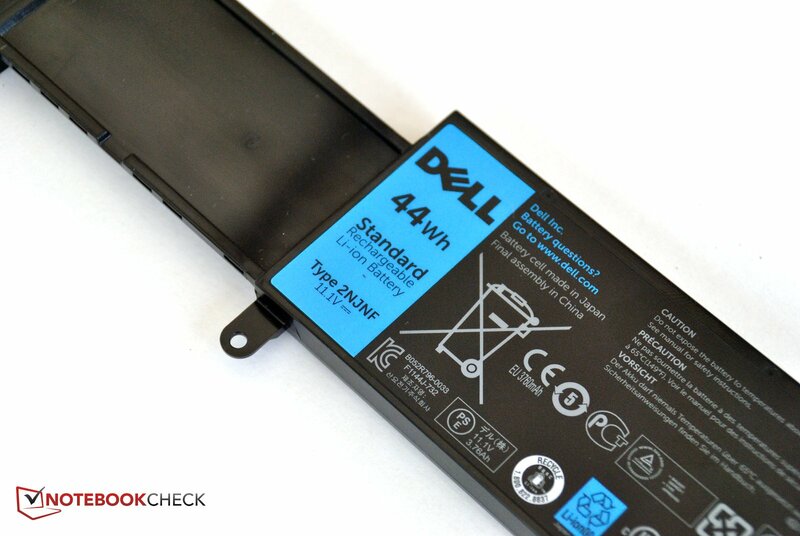 The battery of the Dell Inspiron 14z Ultrabook is securely installed and cannot be taken out without first removing the base cover. This is covered in more detail in the Maintenance section. With a battery capacity of 44 Wh and the aforementioned low power consumption, the Inspiron 14z Ultrabook should be capable of long battery runtime. 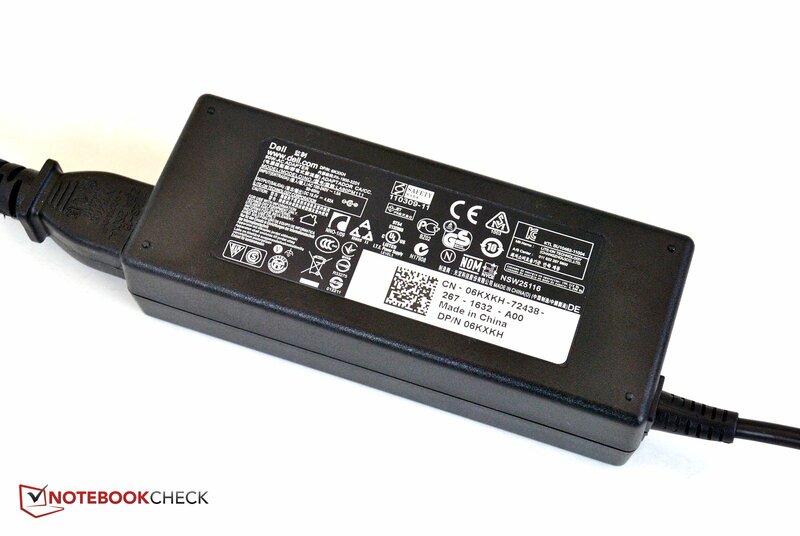 In order to determine maximum battery runtime, we used the Battery Eater Reader’s Test with the display set to its lowest brightness, the Wi-Fi module disabled, and Windows set to the Power Saver profile. These settings allowed the notebook to run for 7 hours, 28 minutes. The more practical Surfing via Wi-Fi Test uses a display brightness of approximately 150 cd/m2 and Wi-Fi is enabled. In this scenario, the ultrabook met our expectations with a runtime of 5 hours 13 minutes. 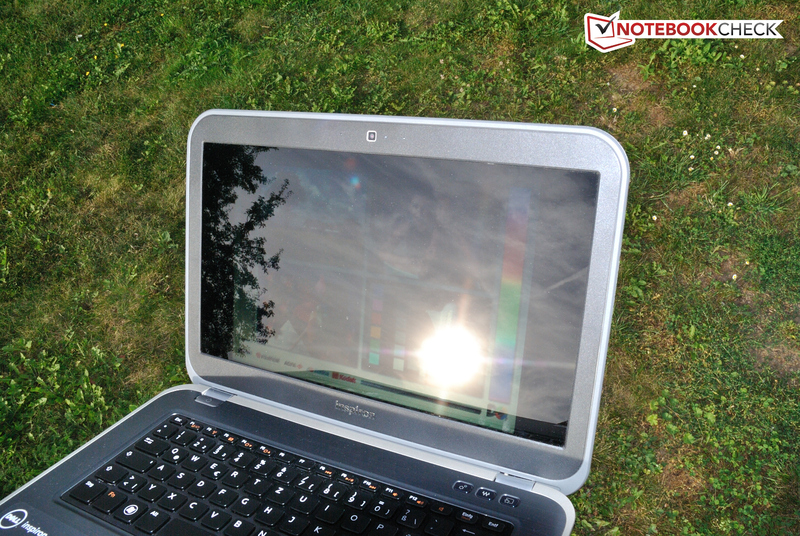 At maximum brightness, the notebook was capable of playing a DVD for 3 hours 45 minutes. As this is longer than most DVDs, users can watch movies without interruption. The worst-case scenario is determined using the Battery Eater Classic Test. In this scenario, a 3D scene is rendered, placing both the CPU and GPU under load. The screen is set to maximum brightness, Wi-Fi is enabled, and the High Performance profile is selected in Windows. 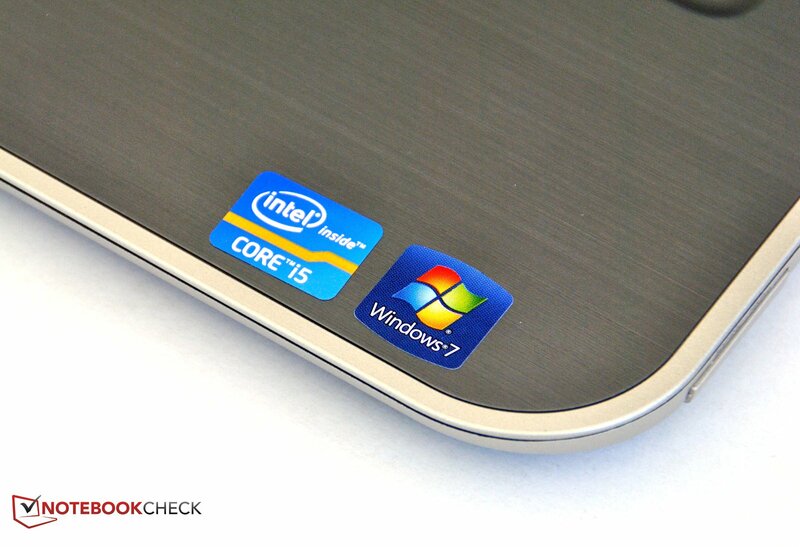 In this test, the Dell Inspiron 14z Ultrabook managed 1 hour 41 minutes. The battery required over 3 hours to fully recharge. 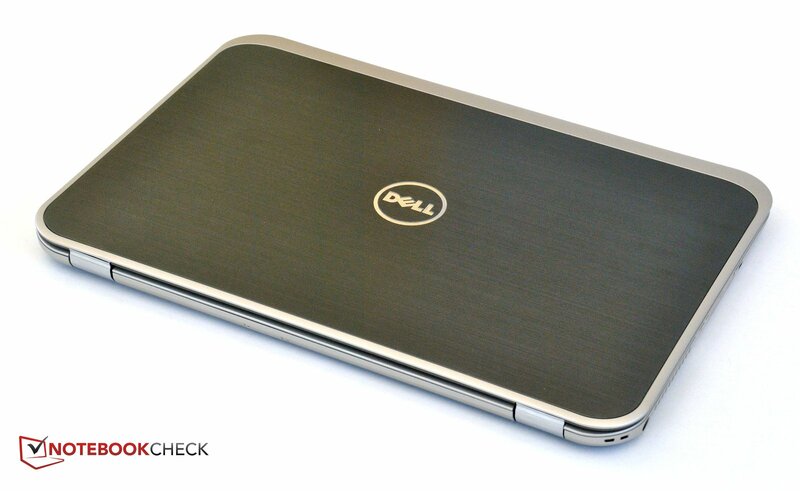 For 900 Euro (~$1125), the Dell Inspiron 14z Ultrabook offers a power-efficient CPU and a middle-class GPU. The resulting combination is well-equipped for multimedia use and office programs load quickly and run fluidly thanks to the installed SSD. While the case is made from a mixture of brushed aluminum and synthetic materials, we found that workmanship was not always good. The hinges held the display securely but were themselves installed slightly skewed. 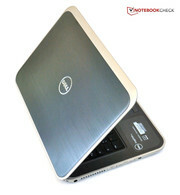 The design is quite similar to that of other Inspiron models. We felt the connectivity was adequate but not particularly high-end. The notebook features both wired and wireless Internet connectivity as well as an optional UMTS module that enables Internet access using mobile broadband. The input devices were uninspiring. The keyboard layout showed more disadvantages than advantages and the typing feel was not subjectively comfortable. The touchpad is large and supports multi-touch gestures but the implementation is marred as the cursor often jumped when a finger was removed from the touchpad. The glossy display demonstrated an average brightness of only 200 cd/m2 making the notebook difficult to use outdoors due to the presence of reflections. Viewing angles were quite small. The ULV (ultra-low voltage) CPU performed rather well in benchmarks, partially due to the dedicated graphics card. The performance was sufficient for everyday use but a bit too weak for playing games at higher details. The SSD proved to be very fast and applications reflected the drive’s overall accelerating effect. The notebook was quiet but did become relatively hot. The power consumption was quite low and the integrated battery was capable of providing a runtime of up to 5 hours while surfing the Web. 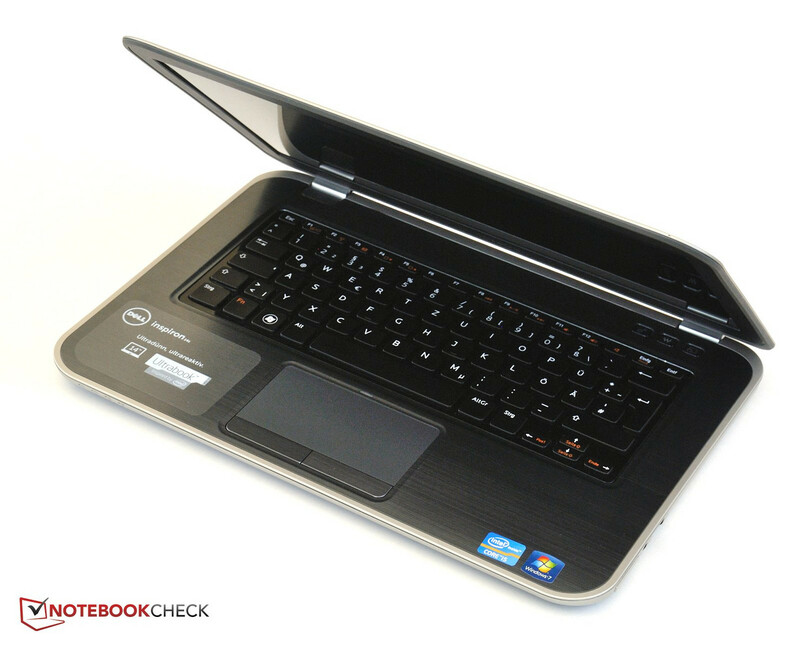 The Dell Inspiron 14z Ultrabook strives to fulfill both multimedia and mobility roles. While it is imperfect in both areas, the notebook is still a decent performer for users who seek a good performance-to-price ratio in these categories. The Enter key has shrunk. The underside has a small maintenance flap. Two RAM modules are hidden behind it. Even the DVD writer can be removed. and then remove the base cover. The user will then have access to all hardware. Even the card reader can be seen. The SSD is placed beneath the battery. 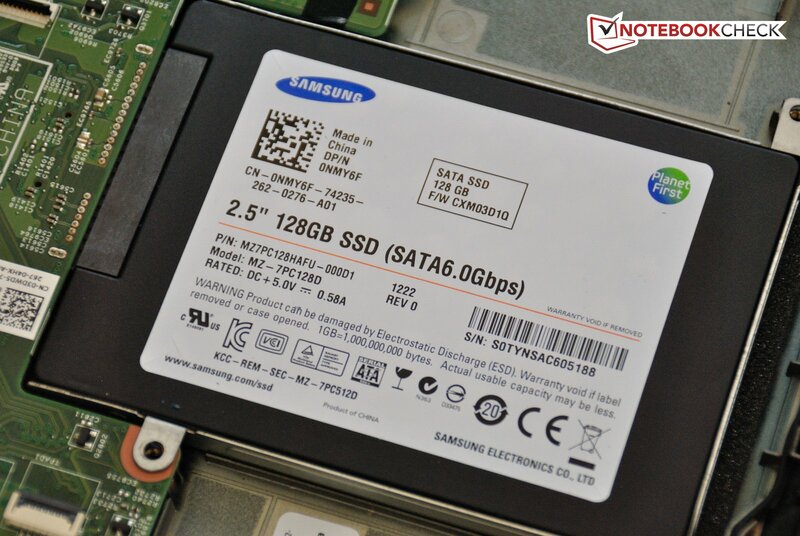 A fast Samsung 830 SSD. This model contains both the Wi-Fi and UMTS cards. The power adapter provides 90 Watts which is more than enough. The Inspiron quickly due to the SSD. deliver sufficient performance for most users. as well as a modern ULV CPU. The ports on the left side are hidden behind flaps. An Ethernet port is included. Of course, there is no flap covering the power port. 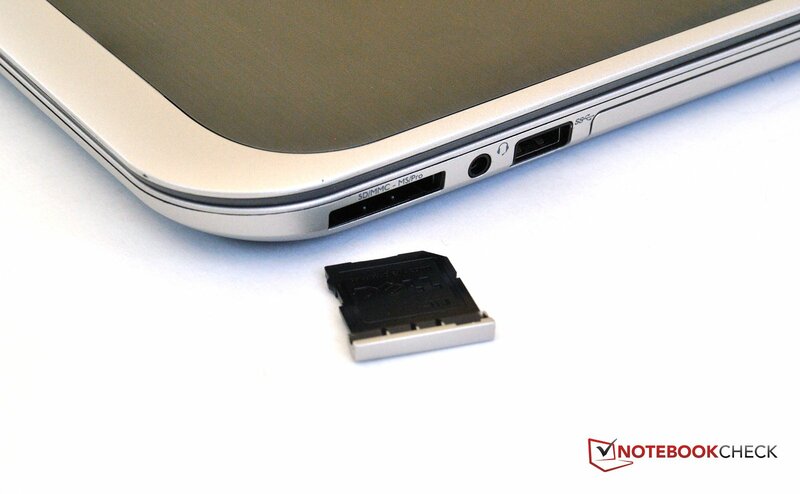 An SD card reader is hidden behind the standard blank. which is secured against unauthorized access. The webcam has a resolution of 1 MP. very reflective and has only modest brightness. The fast SSD and the low emissions. A decent display without distracting reflections and better viewing angles. Dell hides the interfaces on the left with flaps, but leaves the ones on the right side open.